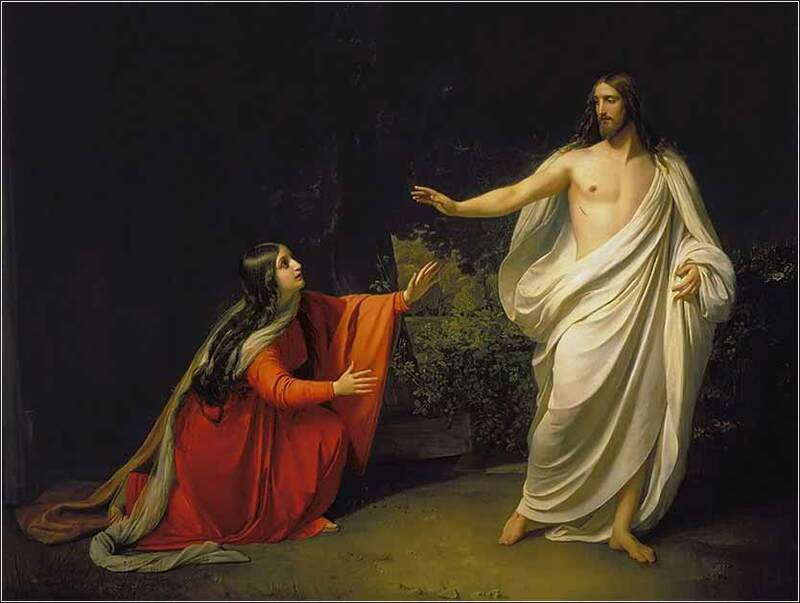 The Appearance of Christ to Mary Magdalene, by Alexander Ivanov, ca. 1836. We only do this every couple of years. You'll need to listen to this on a PC or earbuds to appreciate the agonizing beauty of Rossini’s masterpiece. What verse can you cite to people who tell us the Bible means something different than what is printed? So is it with the resurrection of the dead. What is sown is perishable; what is raised is imperishable. 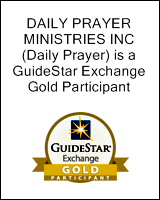 It is sown in dishonor; it is raised in glory. It is sown in weakness; it is raised in power. It is sown a natural body; it is raised a spiritual body. If there is a natural body, there is also a spiritual body. Thus it is written, “The first man Adam became a living being”; the last Adam became a life-giving spirit. But it is not the spiritual that is first but the natural, and then the spiritual. The first man was from the earth, a man of dust; the second man is from heaven. As was the man of dust, so also are those who are of the dust, and as is the man of heaven, so also are those who are of heaven. Just as we have borne the image of the man of dust, we shall also bear the image of the man of heaven. ere, Paul actually finds the flaw in his own analogy. He spoke of our human body as a seed, which disappears and transforms into a great plant or tree. An oak tree is still an acorn, but an acorn transformed, an acorn that has fulfilled its potential. This is success; the acorn that does not transform simply rots and disappears forever. We know that our human bodies will not last. The human body is created from “dust” — natural matter, which we would more likely call “chemicals” today. But this animal houses a soul. Similar to the way an acorn is fertilized from outside to enable it to transform some day, our body is fertilized by a soul. The acorn will disappear, for its only function is to nurture the germ within it, so that it may transform into something greater. But there is a fundamental difference, for our souls will transform into something imperishable. As great as an oak tree might be compared to an acorn, it cannot compare to the form we will take when we are resurrected. For the oak is still just a plant; but our new form, our new “body,” will be imperishable, as are the forms of angels or “the man of heaven” — Christ after His resurrection. The details of our existence after our bodies die is still a mystery. But knowing that we will have the possibility of being much as we are now is comforting; for change is always unsettling and often frightening, and no change moreso than physical death. So, this is one reason for Christ appearing just as he was before he dies; to comfort us, to demonstrate to us that we do not need to fear a radical change. 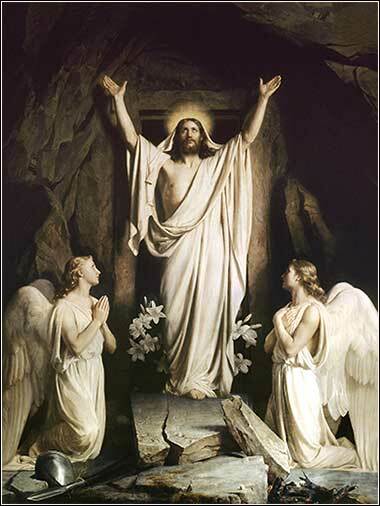 The Resurrection by Carl Bloch, ca. 1873.